Bali Traditional Tour Kecak dance and Fire dance. 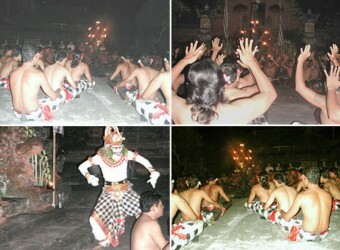 Kecak dance is 100 male performers wearing checked cloth around their waists and make a flame and chanting noise of "Cak-cak-cak". The rhythm is keep going forever in the night with fire. This show is story by legend story ‘Ramayana.